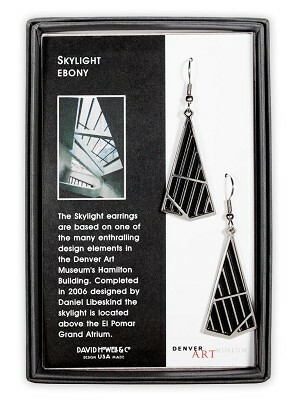 The Skylight earrings are based on one of the many enthralling design elements in the Denver Art Museum’s Hamilton Building. Completed in 2006, designed by Daniel Libeskind, the skylight is located above the El Pomar Grand Atrium. Made of solid brass, electro-plated with non-tarnishing silver finish, hand-enameled, ear wires are hypo-allergenic and they hang approximately 2”. Made in the U.S.A.